There are two types of logic for multiple list filters or workflow enrollment triggers: AND and OR. To identify objects that meet all criteria within a set of list filters or workflow enrollment triggers, use AND logic. 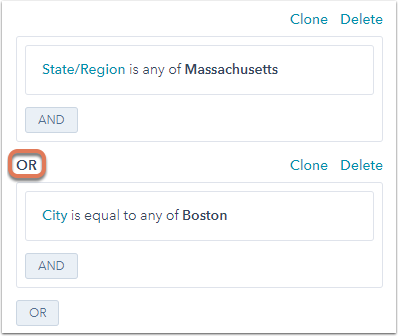 For example, to identify contacts that are from the state of Massachusetts AND from the city of Boston, click AND before adding the second filter or trigger. If you have filters or triggers based on associated object properties, the nested AND button segments objects by two or more of the associated object properties that are true of the same associated object. 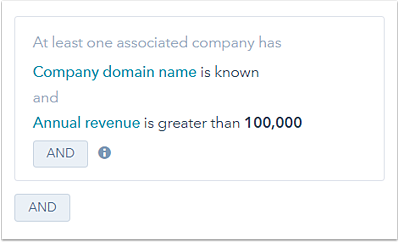 For example, to identify contacts with an associated company with a known company domain name AND annual revenue greater than 100,000, click the nested AND before adding the second filter or trigger. To identify objects that meet at least one criteria within a set of list filters or workflow enrollment triggers, use OR logic. 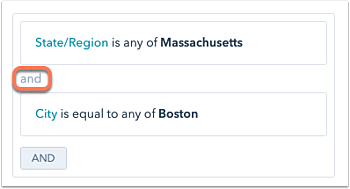 For example, to identify contacts that are from the state of Massachusetts OR from the city of Boston, click OR before adding the second filter or trigger.